Purina Pro Plan Veterinary Diets FortiFlora Feline Probiotic Complement is a complementary pet food for cats and kittens to help support intestinal health and balance. 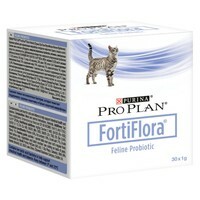 Purina FortiFlora is a unique supplement that contains live lactic acid bacteria to help support intestinal health and balance. Sprinkle 1 sachet daily over your cat's regular food. 1 pack contains 30 x 1g sachets. This product is excellent for cats that have stomach issues. I use this daily in my cat food as it helps keep good bacteria in her stomach as she has chronic pancreatitis. Even on a day when she does not want to eat I just sprinkle this on her food to tempt her and it works. My cat absolutely loves Fortiflora. I sprinkle half a sachet onto his food twice a day. It's palatability is excellent . An excellent addition to daily nutrition. I give this to my cat every day, he has an upset stomach.Stopped using it and he went back to having accidents.Definitely works.Very prompt delivery.